Wow, is it really Friday already? I love being a housewife but one of the side effects of not working outside the home is that you lose track of the days very easily. Thank you so much to everyone who voted on my Friday Fashionistas poll this week. The results are in and the majority likes lots of pics with a few fun facts. Considering the 10 hours I spent on my Amelia Earhart post and 7 on Marilyn Monroe (no joke! ), I am quite relieved. I really do enjoy researching these posts, gathering lovely photos and writing it up but I often wonder, "Is everyone really reading -all- of this? Maybe a few facts would be better?" So, here we are- just the facts, m'am. Since many of you did read the long bios and enjoyed learning about these ladies, I will be leaving links for further reading on each post. ♥ Betty and I are both natives of St Louis! My favorite Betty Grable movies include Pin Up Girl and How to Marry a Millionaire, what are yours? She had SUCH style and SUCH class! I love her. Wow. those shots of her blow me away. I cannot believe they insured her legs for a million dollars! that is unbelievable. and I shall definitely be seeing if my library has any betty grable films. Thank you so much for enriching my pin up girl knowledge. Betty can do no wrong on the fashion (and hairstyle) front in my books, and she's been a leading source of yesteryear Hollywood inspiration for me for as far back as I can remember. I adore all of these photos - and especially loved seeing what a dead ringer you are for her when you do your hair that way (gorgeous!!!). Wishing you an awesome, sunshine filled weekend, sweet gal! WOW, I just LOVE her! 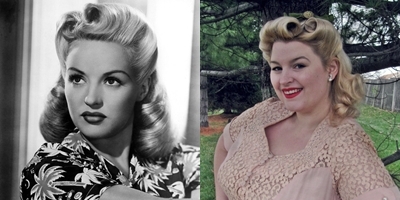 <3 I'm a great admirer of Betty Grable. She just may be my favorite of all my favorites - top of the list! She was truly a great woman, so sweet and talented, not to mention utterly gorgeous. Thanks so much for this post! I'm not really a 40s gal but I LOVE Betty Grable, she always looks so fabulous and I agree with Tasha, she always seemed down to earth. She was also married to bandleader and amazing trumpet man Harry James, such a cool couple! Ah yes! Betty is definitely my number one famous fashion icon. I always try to model my vintage fashion from her because of her classic 40s look, and her FANTASTIC hair. ;) I watched a Betty Grable movie that I adored, I can't remember the name, but she played a TV variety show star who went through all sorts of trials and fails trying to adopt a baby, and at the end ends up with three. :D It was such an endearing movie.